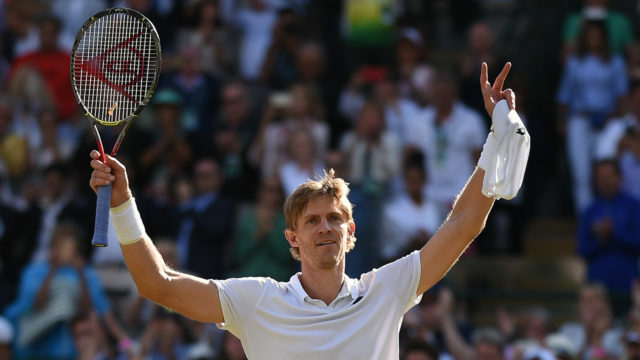 Kevin Anderson of South Africa made history by defeating the top seed and defending champion, Roger Federer in a thriller that was fought for 4 hours and 14 minutes. At the handshake, the 33-year old lanky man won the greatest victory of his career, by the score of 2/6; 6/7 (5); 7/5; 6/4; 11/13. The encounter between Novak Djokovic and Kei Nishikori commenced on Centre Court at the same time, but Federer took the opening set from Kevin Anderson in just 26 minutes. Anderson was taken to deuce before holding serve in the first game of the second set and he broke Federer’s serve to lead 2-0. He took the third game at love, as did Federer. Kevin was behind all through the fifth game and conceded the break. The defending champion leveled and the set proceeded to a tie break. Kevin won the first two points but Federer led by 4 points to 2 at the changeover and clinched the set 7/6. In the third set, Anderson’s serves started registering with precision and he won his service games quickly. As Federer was leading 5-4, Anderson needed to hold to stay in the match and he reached 40-15 with a canon clocked at 132mph but Federer battled to deuce, got the first advantage and match point but it was annulled with an ace. After two deuces, Kevin leveled at 5 games apiece. In the next game, Federer was down 30-40 and deuced but lost the game to concede the first service break to his opponent. Serving for the set, Anderson faced three break points but served his way back to win the set 7-5. The fourth set was a battle of serves in which Anderson prevailed 6/4 to level the match. The final battle came in the fifth set decider. A patter emerged after the first three games, as each player held serve with Federer winning and Anderson needing to level. In the eighth game, Anderson saved a break point to hold. In the eleventh game with Anderson serving at 0-30, Federer slipped on the turf and his opponent proceeded to win the game. In the final set at the Championships, there are no tie breaks. The battle of serves ensued. Federer won the thirteenth game with precision serves landing close to the lines. For three service games, Anderson recovered to win games. The pressure was on the champion to hold. With games at 11-all, Roger leveled at 30-all but made a double fault to face 30-40 break threat that gave the game to Anderson. With the match resting on his serve, Kevin powered his way to reach two match points at 40-15. He sent the serve wide the right and Roger’s return landed in the net. Meanwhile, while Federer and Anderson were in the heat of battle, Novak Djokovic overpowered Japan’s Kei Nishikori 6/3; 3/6; 6/2; 6/2.